Part 1 premiered in Thailand on January 18th and at three hours duration, it’s quite a history lesson. It has to introduce a tangle of players and future players in the palaces of enemy Kings - in Siam (now Thailand) and neighbouring Burma (now Myanmar). While the story of the consolidation of Siam is mainly of interest to the Thai people, this is also a sumptuous recreation of a 16th century far east, quite different to the Chinese and Japanese cultures. It looks very different in terms of clothing and architecture, and the tropical climate provides a very different backdrop than previous oriental epics. For anyone who’s visited the country, there are familiar temples, elephants, even tattoos, and the fire-jugglers still seen on the country’s beaches. The story centres on the young Prince Naresuan as he is taken hostage away from his family, to the Burmese capital of Hongsawardee, by King Bayinnaung (Sampob Benjatikul) who pretty much adopts him and raises him as a new hope. 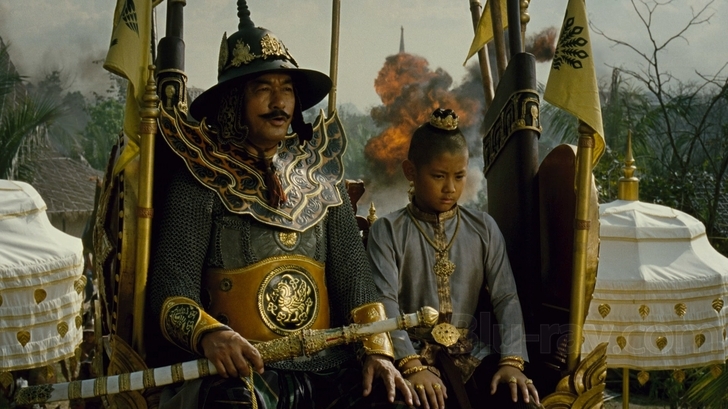 Despite keeping him prisoner, he still respects the Prince as royalty and has him tutored by the Head Buddhist Monk, who is extremely wise (to an almost Jedi standard) and an expert in the art of fighting - Mahathera Kanchong is one of the few familiar faces in the cast, and is played by Sorapong Chatree. Now a monk himself, the prince befriends two orphans, Manechan and Bunthing, who are also to become important to the story. Manechan lives at the temple, but doesn’t know how important she really is, and Bunthing, despite being a renegade thief rather than a noble, is also learning to be a great warrior as the Prince’s sparring partner. To boil the history and all the legends about historical characters down to a more manageable size, obviously some of the events and characters. Part 1 maybe easy for the people of Thailand who already know something about Naresuan, it was a little hard for me to follow all the long character names and who they were. Not to mention the geography of the area as it was 400 years ago. For instance Thailand was then called Siam, Burma (now Myanmar) was then Hongsa, or Hongsawardee. Also Thailand is probably keen to see the exploits of the young hero brought to life, but for the rest of us, it’s just a historical drama. If you can follow it, the hours of diplomatic strategy are intriguing, particularly the work of King Bayinnaung, but they only becomes relevant when you’re watching Part 2. I could argue that the director could have spiced it up more to make it more of an entertainment, but it’s difficult in a country that respects its royalty so much. I believe the director is actually a Prince himself! The film has an epic feel, due to the complete recreation of the Burmese capital as it was in the late 16th century - a huge outdoor set that was built full-size from scratch (see my later entry about the 'making-of' documentary). The palace sets are lushly recreated, the streets are full of people and most of the simple dialogue scenes are in front of windows that display action stretching into the distance. As an evocation of past events, the film succeeds completely. The temptation might be to start with Part 2, then watch Part 1 as a huge flashback. But it worked for me in sequence, particularly watching them on consecutive days. Treat Parts 1 and 2 as one huge film, then the action in Part 2 will compensate for the long build-up in Part 1. ThaiCinemaOrg has a good selection of photos of the main cast. Bangkok Post has a lengthy interview with the director. See also my posts on King Naresuan Part 2 and the making of the trilogy. UPDATE June 2007 - released on DVD and blu-ray in the US. The biggest movies in Thailand at the moment are the first two parts of an epic trilogy. The story of the King who fought to unite and defend the nation of Siam. The director even sought advice from Peter Jackson in planning such a large scale project and started production over three years ago. Like Lord of the Rings, the running time of all three films should approach a total of nine hours. They are all directed by Chatrichalerm Yukol, who made the epic Legend of Suriyothai (2001), the events of which also lead into the story of King Naresuan. The huge advertising hoardings, posters and trailers, cannily work for both of the first two films, using the image of adult King, even though he doesn’t appear until the second film. Released within weeks of each other, Part 1 and Part 2 complement each other. The third film won’t be released until December 5th 2007, in order to coincide with the present King of Thailand’s 80th birthday. To mark the event, there’s been a merchandising and publicity blitz across the country. Movie props adorn the major cinemas – we saw a larger-than-life prop statue of Buddha, costumes and weapons from the film, in the Paragon Cineplex atop the Siam Centre in Bangkok, where we saw the films. Thankfully, there were plenty of screenings subtitled in English.